The ASTRO A40 TR Headset for PS4™, PC, and Mac is the premier gaming audio solution for professional gamers, including esports athletes, content creators, streamers, and game developers. It was developed with esports athletes to meet their rigorous standards for audio fidelity, comfort, and durability. Able to adapt to any environment, the A40 TR arrives as an open-back headset featuring a swappable precision mic and customizable speaker tags. For loud environments such as pro tournaments, one can transform the A40 TR to a closed-back noise-isolating headset by adding a Mod Kit (sold separately) which features sealed speaker tags, synthetic leather ear cushions, and a voice-isolating microphone. For VR gamers, the A40 TR will fit perfectly over the HTC Vive, Oculus, or PS VR and deliver an immersive audio experience. The MixAmp Pro TR features Dolby Digital Surround Sound processing and enables lag and interference free delivery of game sound and voice communication to the A40 TR Headset. Its simple controls allow for quick adjustment of game-to-voice balance settings, determining how much game sound and voice chat the user hears. It also allows users to select 1 of 4 different EQ modes optimized for different game genres, as well as providing master volume control. All these features make the ASTRO A40 TR Headset and MixAmp Pro TR not only the best pro gaming headset setup, but also the ideal headset for streaming and the ultimate audio solution for all gamers and audiophiles. All TR products are the Official Equipment of Call of Duty, the leading console esports title globally. Get 1,100 Call of Duty points* in Call of Duty®: WWII when you purchase the Call of Duty A40 TR Headset + MixAmp Pro TR (black) direct from our website. A code will be sent with redemption instructions. Hear and be heard with the ASTRO family! Looking for a Stereo PC solution? Click Here. 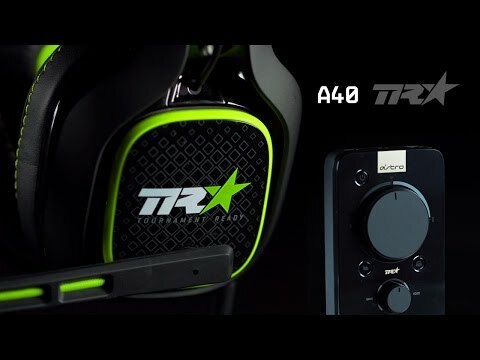 "...the Astro A40 TR with MixAmp Pro TR is the among the finest headsets the audiophiles at Astro have ever made. " If you play Call of Duty you will see an amazing difference in your gameplay. Footsteps etc! Perfect headset for any game and music! I’ve been wanting this head set since 2014 and I was able to finally get it in 2016 when the Tr’s came out and I got them at Pax east for a deal. I’ve owned for 2 years now and it’s the best gaming purchase I’ve ever made. I would recommend getting a mod kit because the ear cups and mic and such is way better and more compfy. This is coming from a 16 year Old and these are awesome I would recommend these if you sit down in front of a desk or close to a tv. Wish they had a A50 Tr that would be awesome. OVERALL: You won’t regret this purchase most comfortable and stylish and customizable headset way worth for 250$! I have been waiting to do a review on these for two years now I wanted to know how good they were and how long they’d last, let me start off by saying these are very comfortable and durable I’ve dropped them several times and they still work like they Day I brought them out of the box. The mix amp software that comes with it is absolutely in credible I have 3 custom mixes that I use for my favorite games and they all isolate footsteps whilst being able to hear pins drop that’s just how good the sound quality is and how well everything flows together between the headset the mixamp and the software, I was a tritton fan boy and I was gonna buy their tritton katana headset but instead I went with the Astro a40 TR’s and I’m so glad I did, this headset is so comfortable and lightweight it’s perfect for long gaming sessions I’ve hit 10+ hours and still felt like I’ve been able to wear them if I wasn’t getting sleepy this is a 100% honest review I’m not here to sell people out I’m telling you why you should buy this amazing headset because it’s just that AMAZING!!!! So far the A40 is awesome had to for 6 months and without the mixamp the headset is useless.